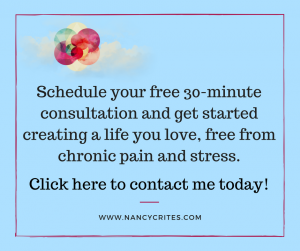 Nancy is unique, she approaches health and healing in a way that is unlike any other practitioner…and she delivers results. I feel better now than I did 20 years ago! Thank you Nancy! Penny W.
Nancy is AMAZING, she like my secret protection, she is always there with a kind word and loving effective support. Jennifer M.
I highly recommend Nancy Crites; she is professional, knowledgeable and thorough, and she explains in detail the how and why of the protocol she recommends and the results are amazing. —Susan P.
When I came to work with Nancy I was suffering from stress to the level that my hair was falling out in large patches. Nancy was so calming from the moment I walked into her office. She led me through how to meditate, which I could never master on my own. Nancy also helped me create a food plan and supplement protocol with the Usana vitamins. Following my accident I came to Nancy’s qigong classes seeking relief for a concussion and other body aches and imbalances. I found relief and healing with qigong. Nancy is a highly skilled and grounded teacher of qigong, thank you! Suzanne P.
Thank you, Nancy ! I have been very sick and suffered debilitating symptoms for many years. After 2 weeks of taking the Usana CellSentials, Proflavonal C, and Biomega. My bowels are functioning regularly, my immune system is stronger then ever- if I feel an earache, headache, or sinus infection coming they do not manifest, they disappear! My chronic pain has lessened and I feel very happy and encouraged! Joan S.
The 28 Day Radiant Health Program ended up not being a challenge at all. In fact, it was a life changer in every way. Although it seemed daunting at first, after a few days I had a spark back that had long been quenched by lack of sleep, energy and way to many carbs and sugars, even gluten was gone. I was amazed, then relieved, at not only ridding cravings but that my sleep was better and my clothes fit much better too. After the challenge was over, my digestion has improve and I have actually lost inches and inches and inches off my stomach. Rebecca C.
Nancy my coach is AMAZING! She is always very encouraging, even when I slip up (like eat pizza) LOL! Her daily tips and the lifestyle log have made this program really work for me. I always know that if I have a question I can flip her an email. I don’t think this program would have been as effective for me without my coach. She is like my secret weapon! I would recommend this program to anyone who has a real interest in good health, feeling better, looking better and making themselves a priority. I have received alot of questions from my friends, “What are you doing to lose the weight?” or “Can I have your eating plan?”. Our health should never be taken for granted! During the 28 Day Radiant Health Program, I noticed many wonderful things: my skin started to look so much more radiant, I wasn’t ‘crashing’ in the mid-afternoon as I used to. One of the biggest changes for me was my sleep! I’ve always had trouble sleeping and in my second week of this lifestyle change, I found that I was able to fall asleep quickly and not wake so much during the night. It was wonderful! Another huge bonus was that I started to lose weight: my clothes were fitting differently! This lifestyle change has helped me physically, mentally and emotionally. I truly recommend taking this Radiant Health Program, it really works! Heather L.
I enjoy the convenience of the Nutrimeal shakes and bars which are great for a quick meal or snack and are easy to take to work or on the road. I would highly recommend the Usana RESET challenge to anyone who is interested in improving their health and having a better quality of life. Kathy K.
When I began the 28 Day Radiant Health Program, I knew the Usana products were great. I had used them as my prenatal vitamins for both babies and also while nursing them. I have always attributed my kids’ healthy bodies, happy dispositions, and perfect weights, along with my “butter” milk to the great Usana vitamins in my system. Now though, I can say that the Usana products have done something just for me. By releasing my sugar and carb cravings I have done something more than just lose belly fat, I’ve gotten my spark back. Janet T.
I am only in the third week of the 28 Day Radiant Health Program,and already I feel amazing! I am sleeping better, my headaches are gone, I have way more energy. My friends tell me I look great and ask if I ‘ve been losing weight. They are asking what I have been doing! I love the yummy smoothies and I never feel deprived, it is a great lifestyle. The weekly coaching sessions are educational and supportive, thanks, Nancy! Jenna T.
This 28 Day Radiant Health Program, is a healthy lifestyle change and it has helped me physically, mentally and emotionally. The coaching with Nancy, the daily tips all made the difference, I feel educated and empowered. I truly recommend this program to ‘reset’ your life! – Alice M.
The 28 Day Radiant Health Program gave me back my energy that had long been quenched by babies, no sleep or exercise and too many carbs and sugars. I was amazed, then relieved, at not only ridding cravings but that my sleep was back, and my clothes fit much better too. After the challenge was over, I have actually lost inches and inches and inches off my stomach. Alexis W.
“When I began my qigong classes with Nancy she helped me discover that there is joy all around me and it comes in smaller packages than I had thought before. Now as I have developed mindfulness, I find it’s the simple things, like a sunset, a cup of tea, a flower or a snowflake, a walk, that lift my spirits and make me smile. I realize I had been looking for happiness by buying more and more things. Now I realize that it doesn’t take much to be happy and joy comes in the simple things, in unexpected moments, & often for free! Thank you, Nancy, for helping me appreciate the joy in the small things!” Wendy M.